The Battle of the River Plate in December 1939 was the Allies’ first naval victory of the Second World War. The involvement of the cruiser HMS Achilles, more than half of whose crew were New Zealanders, was greeted with jubilation in New Zealand. The German pocket battleship Admiral Graf Spee had been commerce raiding in the Atlantic and Indian oceans since the beginning of the war in September. On 13 December, three Royal Navy cruisers, Exeter, Ajax and Achilles, intercepted the German warship off South America’s River Plate estuary. While the Exeter sustained heavy damage in the brief encounter, the Graf Spee was also hit and forced to seek refuge in Montevideo, capital of neutral Uruguay. The captain of the Graf Spee, Hans Langsdorff, believed the British were assembling an overwhelming force to prevent escape. Rather than put his men at risk, he scuttled his ship on 17 December. Langsdorff committed suicide three days later. 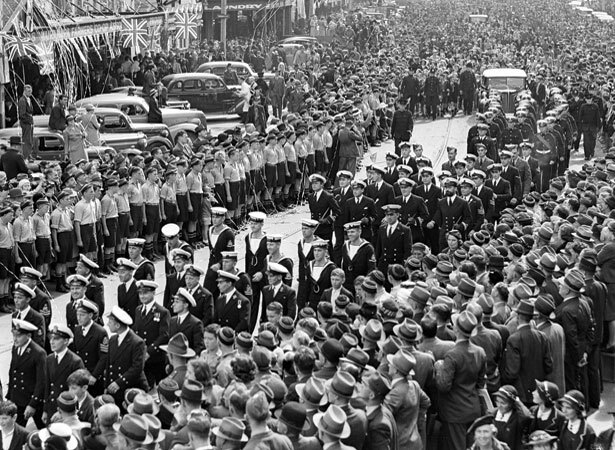 The crew of the Achilles received a hero’s welcome when they returned to New Zealand in February 1940. Parades in Auckland and Wellington (on 2 April) drew huge crowds. We have 12 biographies, 18 articles, related to 100,000 welcome home HMS Achilles crew.